The hip joint is a ball and socket type of joint. It consists of a round ball (Femoral Head) at the upper end of the thigh bone (Femur) which fits into a cup shaped socket (Acetabulum) of the pelvis.The surfaces in contact are lined by glistening smooth articular cartilage which allows smooth painless movement and cushions weight transmission. The joint is surrounded by the capsule and ligaments which hold it together. The prosthesis consits of a cup which is fixed into the damaged acetanulum and a metallic ball which replaces the damaged head. The ball is connected to a femoral prosthesis which is fixed inside the femoral shaft. A Hip Replacement may be cemented or uncemented. In a cemented hip replacement a polyethylene cup and metallic femoral stem are fixed to bone by the use of special cement. In an uncemented hip replacement the cup consists of a metallic shell with a liner which may be polyethylene, ceramic or metal. The femoral stem is also metallic. Both the shell and femoral stem have a special coating which allows it to get fixed to bone without the use of cement. Newer Materials - like ceramic and metal on metal are aimed at increasing the life of the artificial hip. New prosthesis - like surface replacement and large ball metal on metal are aimed at better hip function and mobility. Newer Designs - Shorter femoral components such as the Proxima are easier to revise. Computer Assisted Surgery - Use of computers during surgery increase the accuracy of the surgery. A computer assisted tracking device ( based on the same principle as a global positionig system ) is used. Sizing and positioning of the implant is improved. Minimally Invasive Surgery - Conventional Hip Replacement is done through a 14 to 20 cm incision. Minimally invasive Hip Replacement is done through a smaller incision which is approximately half the conventional size. 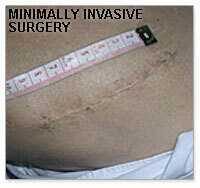 This is a more physiological and less traumatic surgery and results in less pain, less blood loss, less hospital stay. Complications such as infection and dislocation are lower. c. Improved quality of life with ability to do normal activities and pastimes. How long does a Hip Replacement last? - A replaced hip can last 15 to 20 years or even longer. Usually for a patient above 60 years, the artificial joint serves them for their lifetime. Infection: Infection following a joint replacement is highly dangerous. It can occur at any time and infection from any part of the body can spread to the implant. Infection in any part of the body should be treated promptly. For surgical procedures like dental work, prophylactic antibiotics should be taken. If there is fever, discharge, redness or pain in the wound contact your doctor immediately. © 2018, Dr Darius Soonawalla.